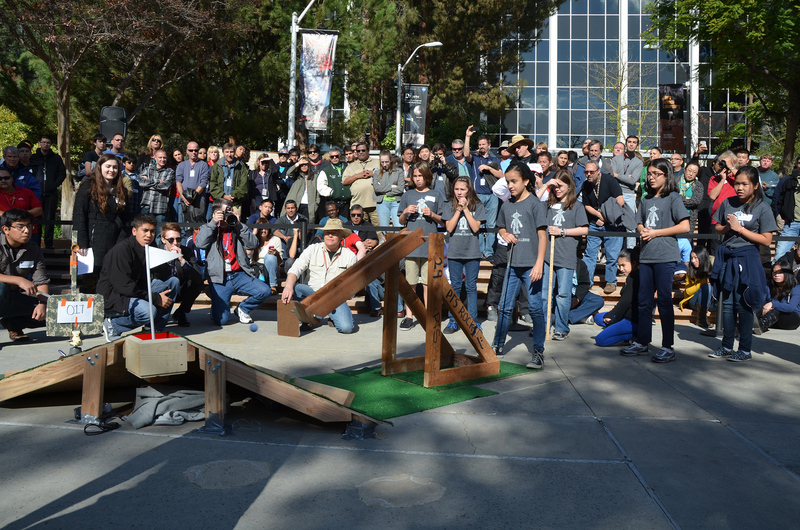 Students from 19 high school teams across Southern California, as well as NASA professionals, took part in a “Hole-in-One” contest in the Invention Challenge last month at NASA’s Jet Propulsion Laboratory, in Pasadena, Calif.
And while the Invention Challenge is really for the kids, JPL employees are always encouraged to participate. This year, 11 additional teams made up of engineers and scientists from JPL competed for pure bragging rights. The JPL winning team, consisting of Alan DeVault and Scott Nolte, earned a time of 0.62 seconds, a hair slower than the winning student team. If you’re interested in getting the specs on next year’s challenge, start checking the Invention Challenge Web site in mid-August 2014 for details, at: http://www.jpl.nasa.gov/events/inventionchallenge/. This article appeared in the January 2014 issue of RocketSTEM. You may download the entire issue as a PDF file here, or view the magazine online in a full-screen viewer here.